Write these embroidery formats and do sew much more! Owners of Viking Designer 1 machines can write both floppy and USB sticks using a built-in CIM utility similar to your Disk manager program! Baby Lock, Brother and Janome machines which usually do not like Mac-written USB sticks will work with Convert It, Mac! This works because CIM can remove the hidden Mac OS files from the stick which often confuses those machines. This process is completely automatic. You won’t even know it is happening. Things just work! Note: You cannot convert an image into embroidery! There is no such thing as “conversion” from an image or vector file into embroidery. They are unrelated things. The concept is called ‘Digitizing’ which requires a person and skill and a digitizing program like our StitchArtist. There are no good auto-digitizing programs for anything more than the simplest art, although it has been attempted by many. If you need a design to sew out, hire a person to digitize the design. Browse embroidery designs, images, text files and even files in zips such as those you find on the internet! View as thumbnails or table view with extended information such as file date, thread usage, stitch count and more. Convert designs between different embroidery formats including most home embroidery machine types. Colorize designs in PES and VP3 with thread brands. Possibilities include ARC, Isacord, Hemingworth, RA, Madeira, Sulky and many more. Includes the Embrilliance Thumbnailer for Mac which lets you see embroidery designs in Finder. Auto Baste will baste the rectangular outline of a design. Automatically create design notes, including a thread shopping list. Estimate the thread usage for a design. Prints out both design thumbnails and actual size templates which can be used for design placement. Drag and drop designs right to a floppy or USB stick for instant use in most machines. Browse designs, images, text files and even zips! When you want to embroider, one of the first steps is finding a design for use in your machine. Without Convert It, Mac your designs have only names. The Mac’s Finder can’t show you the stitch count, design size, thread colors or any other information about the design. Designs are often released in .ZIP files, which reduce the size of a collection, making it easier to download and duplicate. The problem is that in order to use designs, you have to unzip them. This usually means one of two things; now you have two copies of the designs – somewhere – or you have the knowledge and time to decide whether to keep the unzipped versions, and keep them organized. Of course, using those designs means unzipping them. But what about those times when you get a ‘Corrupt Zip Entry’? Well, Convert It can safely make use of those too, and you won’t even have to know. Convert It, Mac is a seriously good translator for embroidery designs. It understands virtually every design, and can write at least one format that every machine out there today can understand. If you have ever wanted to embroider a towel, you probably floated a layer of water-soluble stabilizer over top of the hoop. The problem is that this could use some anchoring stitches before the embroidery starts – this prevents the stabilizer from moving around. There used to be kind digitzers who would put various versions of ‘basting files’ out for us on the internet. Later, some machines had the feature built-in. But have you noticed that if the baste is the same size as the design, you can trap some of the basted threads under the design. The Auto-Baste solves this by making the baste stitching ever-so-much-bigger than the design. And it is adjustable. The design size, stitch count, thread usage per color, and more are wonderful information to have. You can also open the TXT file in your editor, such as TextEdit. But also, it generates a shopping list for thread; Convert It examines the threads used by the digitizer and matches them in Sulky, RA, Madeira and Isacord. Then it also provides you with the nearest three matches in each of those four brands. Unlike some other programs, the Color Sort feature is ‘intelligent’. It won’t mess up your design, but if any color is repeated, and that repetition can be avoided by sewing that color only once all at the same time, then the design sequence is changed to accomplish it. The result is the same design with fewer color changes. And you have full control over how ‘picky’ you want your color sort to be. Mac users have been left out of embroidery for a long time – dating back to the early nineties when Pfaff had a Mac version. Why? Much of the core technology for embroidery formats is Microsoft Windows(tm) based. In order to create this product, we had to create those technologies on Mac first. That isn’t easy! It took our team over two years to make Convert it! Mac. There are only a handful of people in the entire world who have the knowledge and skill to write software for these machines (We have two of them), so you can see why it hasn’t been common. In fact, some of the biggest players in the world use our technologies in their PC software! Why is Convert It, Mac so essential? One of the most useful tools has always been conversion and cataloging software. Not everybody needs to edit, but they will need to see their designs so they can select the right one for their machines.Convert It, Mac is all about enabling embroiderers. This product makes it possible to use your embroidery designs with your Mac and not have to fire up Windows! Designer 1 utility now included: There is even a complete utility for Viking Designer 1 and Designer USB users! Those users have been forced to use a PC with other expensive software. Not anymore! 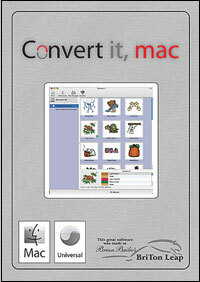 Is Convert It, Mac more expensive than a Windows program? Embroidery on a Mac – priceless! "Yes, this is exactly what I need. This was referred to me by several of my embroidery buddies."